Although everything points to those voice assistants like Amazon Echo, Google Home or future Apple assistant will soon conquer the homes of the world and will become the centre of our houses. The truth is that we do not take advantage of it today to the voice assistants we have at our fingertips. And this, perhaps, is because in most of the cases we do not know all the functionalities that they can offer us. According to a study carried out by Verto, an application analysis company, Siri is the most used voice assistant in the world with 41.4 million users last May. However, like its peers, it also registered a progressive decrease, and this figure is 15% lower than last year. If you have an Apple device and you are someone who does not use this voice assistant, certainly when you discover everything that Siri can do for you, you will start to have more consideration. And it allows you to do many tasks without touching the screen of your smartphone, which is very useful in many occasions where we have busy hands, for example, while driving, cooking or grooming. Here are some essential tricks for getting the most out of your iPhone with Siri. Note and put them into practice and see the change before Siri and after Siri. Do you need to call a person and do not want to waste time looking at the contact list? Then Siri will do that for you. With Siri, you can make calls just by saying the person name you want to talk to. How to ask SIRI to call a person? It is very simple. Just ask “Call [Name of person] “, for example, ” Call Lasya”, and the assistant will look up the number in the phonebook to dial it. In case you have several contacts with the same name or different numbers assigned to a person, Siri will ask you to know who to call. On the other hand, if you introduce the relationship you have with each person, you can ask Siri, for example, Call my mother. To indicate who your family and friends are, tell Siri, for example, ” Hema is my Mother, ” and the assistant will remember her. In addition to conventional phone calls, you can also have the ability to use a third-party app to establish the contact. To do this, just tell Siri which app you want to call, for example, ” Call my mother in WhatsApp” or “ Call my mother in FaceTime”. With the arrival of iOS 10, Siri implemented a functionality that allows sending messages to our contacts not only through the native app iMessage but also using third-party applications. How to ask SIRI to send a message to anyone through third-party messaging apps? If instead of typing a message you prefer to dictate to Siri for her to send, what you have to do is say ” Send a message to [Contact Name] by WhatsApp / Telegram / Skype / LINE”. Just be aware that it does not work with all instant messaging apps, for example, you can not do it with Google Hangouts. Of course, you can also send a conventional SMS through iMessage. In this case, say “Send a message to [Contact name] + [Message content]”, for example, ” Send a message to Lasya + I will get home in 10 minutes”. Try not to use conjunctions before the text of the message, otherwise, Siri will interpret that it is part of the content. If you are wrong, before sending the wizard will offer you the possibility to rectify the text. Did you know that you can use Siri to request certain services, such as ordering a taxi, a Cab car or food at home in a simple way and without having to touch the screen of your iPhone? How to ask SIRI to order Taxi or Food? Before using this option, you need to activate the location services for Siri. If you have not already done so, go to Settings, Privacy, Location, scroll down to Siri and dictate and check it When using the application box. Once you have the location services activated, open Siri and say, for example, “Ask me for a taxi”. It will give you the possibility to select some of the taxi and CAB apps that you have installed on your iPhone. Next, it will indicate the approximate time in which they can pick you up and give you the option to request the service by voice commands. Other tricks to take full advantage of Siri on your iPhone are the ones that allow you to control some settings or apps on your mobile phone. How to ask SIRI to control the iPhone Settings and Apps? You have infinite possibilities at your disposal such as manage the calendar, dictate notes, take photos, open apps, configure some settings, put music, etc. To find out all the options available, ask Siri “What do you know? “ And you will see a complete list of settings and apps that allow you to control. For example, you can say “Activate the Airplane Mode” for Siri to do it for you, “Take a picture” to open the main camera or “Make me a selfie” to open the front, or “Set the alarm at 8” to Program the alarm without touching the screen. Siri is a well of wisdom and is able to offer an answer to all your doubts. You have the opportunity to ask Siri about any subject, and the wizard will answer you well with accurate data or a selection of the results can be found online by doing a search for your question. What are all the things we can ask SIRI to show information to us? For example, you can consult general knowledge: ” How many kilometres are three miles? “, “In what year was Christopher Columbus born?” Or “Who is Steve Jobs?” ; Sports results and related data: “Who has won the Indian Football League?” , “Where is the LB stadium?” Or “When does the Cricket season will begin?” ; The weather forecast: “What is the weather forecast in Hyderabad?” ; As well as other issues that Siri will look for on the Internet to offer a response. If you are an active user in social networks like Facebook or Twitter, thanks to the tricks of Siri for the iPhone you will be able to create and publish posts in a blink of an eye from your mobile. How to ask SIRI to post on Facebook or Twitter? The process is simple: say ” Publish to Twitter / Facebook ” (if it is the first time you are publishing post with Siri, Siri will ask you to give access to your account), dictates the text you would like to include in your post, review it And modify what you want, and when everything is correct to say or press ” Publish” . That is it! For the moment the system does not allow to share photos of the gallery using Siri. The procedure is very fast and fluid, so in a few seconds, your post to publish will be ready without touching the screen. Setting an alarm on your mobile phone or scheduling a reminder has never been so easy and convenient as via Siri. Forget about touching the screen and investing the time in adjusting the clock or typing in the text you would like to remember because the iOS wizard lets you do these tasks just by dictating a phrase. How to ask SIRI to schedule reminders and alarms? To create an alarm, all you have to do is say instructions like “Set the alarm at 8 o’clock “ or “Wake me up within 40 minutes”, or set a timer saying “Let me know within 3 minutes”. The method for creating reminders is just as easy and quick. You can add them by saying “Remind me to buy bread in the afternoon”, “Remind me that tomorrow at 10 I have a dentist appointment” or “Remind me to call my friend later”. If you wish, you can also ask Siri to remind you of things when you are near a certain place. For example, you can say “Remind me to buy sugar when I get home” as long as you have entered your address in your contact information. In the sea of photos and videos, we have, finding the content that interests us the reel of the iPhone can turn out to be a real hell. However, Siri can make this task much easier. You can tell Siri to look for you the images and videos according to the date or place where they were taken. This way you can quickly locate the content you are looking for and you will see them together in one place. How to ask SIRI to show certain photos and videos from Gallery? To take advantage of this feature, say “Search for my photos from yesterday’s Party”, “Show me my videos from April” or “Show me the photos from this summer”. Then the assistant will show you the contents that fit your requirements so you can see them and organize them as you want. If you go somewhere and do not know the route to get there, just tell Siri so she can find you the best root through the iOS Maps app. It indicates the street, the number and the city, and Siri herself will be in charge of giving you the indications so that you follow the route without having to touch the screen of the mobile. On the other hand, if you are not very clear where to go, you also have the possibility to ask advice from the virtual assistant. For example, you can say “Show me good and cheap restaurants nearby” , “I need a pharmacy” or ” Take me to the gas station”. Siri will do a search and at the moment will show you the 15 results that best fit your needs and requirements. Check out the suggestions and when you find an option of Siri you will give the instructions to follow the route. One of the most useful tricks that Siri knows is how to read messages from both the iMessage and Mail native applications and from third-party apps, including WhatsApp. For example, if you say “Read me the last email I received”, the wizard will retrieve your last e-mail, tell you the time it has arrived and proceed to read you the sender, subject and content. For WhatsApp messages, use the “Read Me WhatsApp Messages” statement. If this is the first time you are asking Siri, first you have to allow Siri access to the application. Once this is done, the wizard will be able to read you WhatsApp messages, but only those that you have not yet opened. The others can only be consulted directly in the messaging application. These are the 10 incredible tricks of SIRI, a virtual assistant which can help us with various works and saves time. I hope this article of tricks will help you to use your iPhone with Siri in a next level. Note down all the tricks and implement in your daily life and share your experiences before SIRI and after SIRI with our readers. If you have any queries regarding any of the Siri tricks which are mentioned above or if you have any query regarding any of the iPhone issues, let us know in the below comment section. We will get back to you as soon as possible to solve all your queries. 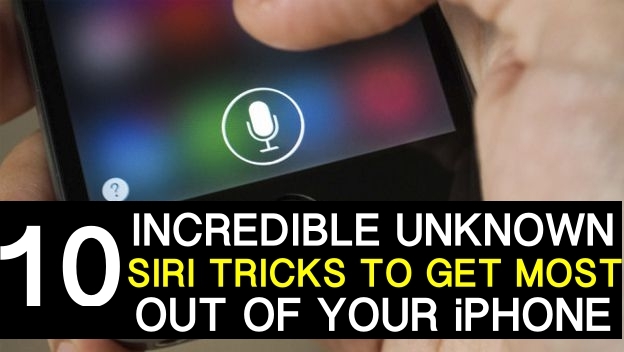 Which SIRI trick do you use more in your daily life?